The DC universe heroes form up in DC Comics Justice League #6. The New 52 roll-out offered consumers same-day digital distribution, gave a lot of relatively unknown writers and artists a chance to play for the majors, took some real chances on some lesser-known books and even rolled the dice on some creators who once strode the comics landscape like kings but had since fallen out of public favor. The first book I recommended in this column was “Justice League #1,” the flagship title of the effort. It turned out to be one of the titles they took no chances on the art and writing whatsoever. And I don't think it needed any changing, because "Justice League" employs a fantastic idea: taking the universe’s best and brightest heroes and letting them loose on the kind of threats they couldn’t overcome alone. It's an idea that has well-served DC and also Marvel Comics, in the form of “The Avengers.” Even old Saturday-morning cartoons – aka “Super Friends” - found success with the theme. Daniel Dean from Titan Games and Comics in Smyrna, Georgia, knew fans were looking to “Justice League” to gauge the quality of the New 52. Lee was a major player in the ‘90s who has continued to create top level work. He was one of the founders of Image Comics and founded WildStorm Comics on his own. Eventually his creations at WildStorm would be incorporated into the DC universe. “While his company has gone through a lot of changes over the years … his appeal has stayed consistent, his style has remained consistent, and he continues to find new audiences,” Dean said. Johns, meanwhile, was racking up an impressive resume’ on many of the company’s biggest titles, even steering his own company-wide crossovers of characters from one book to another. 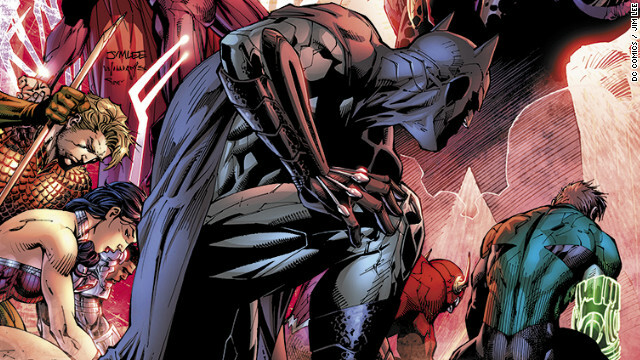 DC Comics “Justice League #6” is a big issue in the title’s storyline. The League finally fights as a cohesive team against Darkseid, one of the biggest and baddest of DC's monsters and super-villains. If you've been reading the title since August, you're in for one heck-of-a grand finale to its first major story arc. It also sets the stage for issue #7, when "Justice League" (which for issues 1-6 had been set five years before current DC universe events) syncs up with the rest of the New 52 timeline. In issue #6 Johns and Lee give us a proper introduction to some of the most talked-about characters in DC history. “Issue 7 is, 'Boom! We are today!' – now you get a sense of how the Justice League interacts with the rest of the world and how they are seen, what they’ve been doing, where they are going,” Johns said. If you're considering picking up the title, issue #6 lets you see the world's greatest superheroes absolutely throw down and you’ll be all caught up when the title shifts into higher gear next issue. Johns said "Justice League" in its current form is all about finding out the truth behind the relationship behind the team. So, until next week, go forth and read, my people. And the reading will be good. Here are some of the comics scheduled to hit the shelves on January 29, 2012. Your local retailer will probably have these and others, so make sure to check with them for more details. You understand therefore considerably in the case of this topic, made me personally imagine it from so many various angles. Its like men and women aren't fascinated until it is something to do with Girl gaga! Your personal stuffs excellent. All the time take care of it up! I loved issue #6, it is what I had been waiting for since #1, and it finally came. It should not have taken this long though; but i loved everything about it; the art, the story, the dialog, the subtle hint to Earth-2, and the back up as well... I love the Phantom Stranger. What an anti-climatic 6th issue after a build-up for the first 5. Very disappointing issue. I adore Supergirl every month, though Action Comics is a close second favorite. The latest issue of Justice League felt a little rushed through the fight, but the end of the story set up some awesome ideas for the future.